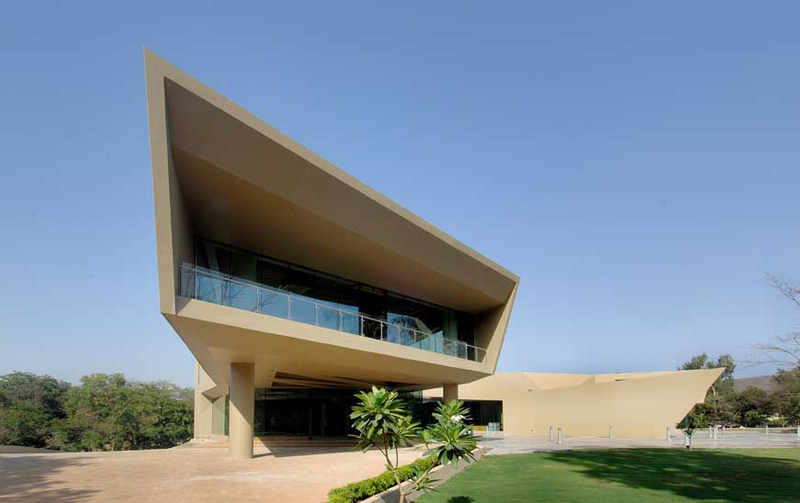 Sanjay Puri Architects in India were recently shortlisted for the LEAF Awards 2011 on their Triose building in Lonavala, India. This dramatically angled, folded concrete skin structure houses a few retail shops, a food court, two restaurants, a large bar and an entertainment gaming area. The building is comprised of three volumes that jut out from the core circulation section that interconnects them. There are several trapezoidal windows, including the large balcony area that cantilevers out offering an impressive view from one of the restaurants housed in that section. In fact, the sculptural quality of the building integrates the external surroundings seamlessly with its interiors throughout the edifice. It’s well worth checking out the rest of Sanjay Puri’s work. Very interesting architecture that pushes boundaries. You can visit their site here.